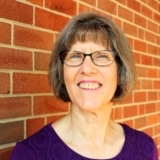 For over twelve years Mary Lynne has taught kindergarten, where she loves seeing the excitement of the smallest Covenant students as they acquire new abilities. Pointing her students to the gospel in both joyful and challenging times to help them realize their need of God’s grace in all situations is a very rewarding aspect of her time in the classroom. Mary Lynne is a graduate of Monmouth College with a degree in Business Education. Her interests include sewing and needlework, and playing with her granddaughter. She looks forward to ushering for the Harrisburg Symphony Orchestra and doing some vegetable gardening. Mary Lynne has raised three children, one of whom graduated from Covenant in 2011.